Born April 3, 1924, in Omaha, Nebraska. Brando grew up in Illinois, and after expulsion from a military academy, he dug ditches until his father offered to finance his education. Brando moved to New York to study with acting coach Stella Adler and at Lee Strasberg's Actors' Studio. Adler has often been credited as the principal inspiration in Brando�s early career, and with opening the actor to great works of literature, music, and theater. While at the Actors' Studio, Brando adopted the "method approach," which emphasizes characters' motivations for actions Marlon Brando was quite simply one of the most celebrated and influential screen and stage actors of the postwar era; he rewrote the rules of performing, and nothing was ever the same again. Brooding, lusty, and intense, his greatest contribution was popularizing Method acting, a highly interpretive performance style which brought unforeseen dimensions of power and depth to the craft; in comparison, most other screen icons appeared shallow, even a little silly. A combative and often contradictory man, Brando refused to play by the rules of the Hollywood game, openly expressing his loathing for the film industry and for the very nature of celebrity, yet often exploiting his fame to bring attention to political causes and later accepting any role offered him as long as the price was right. He is one of the screen's greatest enigmas, and there will never be another quite like him. Brando's groundbreaking star turn in the 1947 production of Tennessee Williams' A Streetcar Named Desire delivered on all of that promise and much, much more; as the inarticulate brute Stanley Kowalski, Brando stunned audiences with a performance of remarkable honesty, sexuality, and intensity, and overnight he became the rage of Broadway. Hollywood quickly came calling, but he resisted the studios' overtures with characteristic contempt -- he was a new breed of star, an anti-star, really, and he refused to play ball, dismissing influential critics and making no concessions toward glamour or decorum. It all only served to make Hollywood want him more, of course, and in 1950 Brando agreed to star in the independent Stanley Kramer production The Men as a paraplegic war victim; in typical Method fashion, he spent a month in an actual veteran's hospital in preparation for the role. 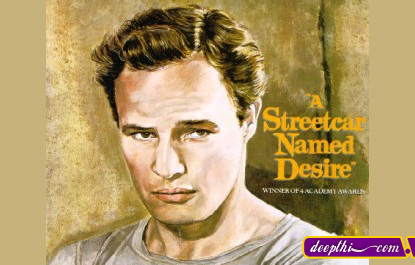 While The Men was not a commercial hit, critics tripped over themselves in their attempts to praise Brando's performance, and in 1951 it was announced that he and director Elia Kazan were set to reprise their earlier work for a screen adaptation of Streetcar. The results were hugely successful, the picture winning an Academy Award for Best Film; Brando earned his first Best Actor nomination, but lost despite Oscars for his co-stars, Vivien Leigh, Karl Malden, and Kim Hunter. Again with Kazan, he next starred in the title role of 1952's Viva Zapata! After walking out of the French production Le Rouge et le Noir over a dispute with director Claude Autant-Lara, Brando portrayed Mark Antony in the 1953 MGM production of Julius Caesar, sparking considerable controversy over his idiosyncratic approach to the Bard and earning a third consecutive Oscar bid. In 1954, The Wild One was another curve ball, casting Brando as the rebellious leader of a motorcycle gang and forever establishing him as a poster boy for attitude, angst, and anomie. That same year, he delivered perhaps his definitive screen performance as a washed-up boxer in Kazan's visceral On the Waterfront. On his fourth attempt, Brando finally won an Academy Award, and the film itself also garnered Best Picture honors. However, his next picture, Desiree, was his first disappointment. Despite gaining much publicity for his portrayal of Napoleon, the project made a subpar showing both artistically and financially. Brando continued to prove his versatility by co-starring with Frank Sinatra in a film adaptation of the hit Broadway musical Guys and Dolls. Another Broadway-to-screen adaptation, The Teahouse of the August Moon, followed in 1956 before he began work on the following year's Sayonara, for which he garnered yet another Oscar nomination. In 1958's The Young Lions, Brando co-starred for the first and only time with Montgomery Clift, another great actor of his generation; it was a hit, but his next project, 1960's The Fugitive Kind, was a financial disaster. He then announced plans to mount his own independent production. After both Stanley Kubrick and Sam Peckinpah both walked off the project, Brando himself grabbed the directorial reins. The result, the idiosyncratic 1961 Western One-Eyed Jacks, performed respectably at the box office, but was such a costly proposition that it could hardly be expected ever to earn a profit. In 1962, Mutiny on the Bounty underwent a similarly troubled birthing process; Brando rejected numerous screenplay revisions, and MGM spent a record 19 million dollars to bring the picture to the screen. When it too failed, his diminishing box-office stature, combined with his increasingly temperamental behavior, made him a target of scorn for the first time in his career. The downward spiral continued: Brando himself remained compulsively watchable, but suddenly the material itself, like 1963's The Ugly American, 1966's The Chase, and 1967's A Countess From Hong Kong, was self-indulgent and far beneath his abilities. His mysterious career choices, as well as his often inscrutable personal and professional behavior -- he was quoted as declaring acting a "neurotic, unimportant job" -- became the topic of much discussion throughout the industry. He continued to push himself in risky projects like 1967's Reflections in a Golden Eye, an adaptation of a Carson McCullers novel in which he portrayed a closeted homosexual, but the end result lacked the old magic. While Brando still commanded respect from the media and his fellow performers, much of Hollywood began to perceive him as a bad and unnecessary risk, a perception which features like 1968's Candy, 1969's Queimada!, and 1971's The Nightcomers did little to alter. The Brando renaissance began with 1972's The Godfather; against the objections of Paramount, director Francis Ford Coppola cast him to play the aging head of a Mafia crime family, and according to most reports, his on-set behavior was impeccable. Onscreen, Brando was brilliant, delivering his best performance in well over a decade. He won his second Academy Award, but became the subject of much controversy when he refused the honor, instead sending one Sacheen Littlefeather -- supposedly a Native American spokeswoman, but later revealed to be a Hispanic actress -- to the Oscar telecast podium to deliver a speech attacking the U.S. government's history of crimes against the native population. Controversy continued to dog Brando upon the release of 1973's Last Tango in Paris, Bernardo Bertolucci's masterful examination of a sexual liaison between an American widower and a young Frenchwoman; though critically acclaimed, the picture was denounced as obscene in many quarters. Despite his resurrection, Brando did not reappear onscreen for three years, finally resurfacing in The Missouri Breaks opposite Jack Nicholson. Although he had by now long maintained that he continued to act only for the money, the eccentricity of his career choices allowed many fans to shrug off such assertions; however, never before had Brando appeared in so blatantly commercial a project as 1978's Superman, earning an unprecedented 3.7 million dollars for what essentially amounted to a cameo performance. His next appearance, in Coppola's 1979 Vietnam epic Apocalypse Now, was largely incoherent, while for 1980's The Formula, he appeared in only three scenes. And for a decade, that was it: Brando vanished, living in self-imposed exile on his island in the Pacific, growing obese, and refusing the few overtures producers made for him to come back to Hollywood. Only in 1989 did a project appeal to Brando's deep political convictions, and he co-starred in the anti-Apartheid drama A Dry White Season, earning an Academy Award nomination for his supporting role as an attorney. A year later, he headlined The Freshman, gracefully parodying his Godfather performance. Tragedy struck in 1990 when his son, Christian, killed the lover of Brando's pregnant daughter, Cheyenne; a long legal battle ensued, and Christian was found guilty of murder and imprisoned. Even more tragically, Cheyenne later committed suicide. The trial placed a severe strain on Brando's finances, and he reluctantly returned to performing, appearing in the atrocious Christopher Columbus: The Discovery in 1992. He also wrote an autobiography, Songs My Mother Taught Me. Don Juan DeMarco, co-starring Johnny Depp, followed in 1995, and after 1996's The Island of Dr. Moreau, Brando starred in Depp's directorial debut The Brave. In 1998, he appeared in Yves Simoneau's Free Money, headlining a cast that included Donald Sutherland, Mira Sorvino, Martin Sheen, and Charlie Sheen. Again absent from the public eye in the first year of the new millennium, Brando made news again in 2001 as health problems forced him out of a cameo role in director Keenan Ivory Wayans' horror spoof sequel Scary Movie 2. Replaced on short notice by actor James Woods, and with a few minor changes to the script to accommodate its new actor, Scary Movie 2 nevertheless finished filming on schedule and was released in July of 2001. Shortly after, Brando made his first film appearance in three years with his role in director Frank Oz's one-last-heist thriller The Score (2001). Though the film's production was plagued with rumors of Brando's curious on-set tirades and bizarre behavior, filmgoers remained eager to see the actor re-teamed with former Godfather cohort Robert DeNiro, with Edward Norton and Angela Bassett rounding out the exciting cast.